As I discuss on the Kickstarter Lesson about the backer survey, the timing of your survey depends on your shipping methods. If you’re sending pallets of product directly from your manufacturer to different fulfillment centers worldwide like we do, you need to send out your backer survey well before you complete production, meaning that months will pass between that survey and when you actually ship individual games to backers. Thus some backers will have different addresses by the time you ship. Hopefully during that time you’ve maintained communication with backers, giving them ample opportunities and channels to send you address updates. For example, I’ve received about 200 address change e-mails in the last 4 months. However, before you ship, you need to send out a formal request to all backers to give them one final chance to send you an address update. This will be one of the most important messages you ever send your backers, so you should send it both by e-mail (I recommend MailChimp) and by Kickstarter update to try to reach as many people as possible. Timing: The timing of this message is key. I would recommend sending it about 10-14 days before you will ship all the packages (in our case, that would be 10-14 before we need to upload shipping orders to various Amazon fulfillment centers). That gives backers time to reply, and it’s close enough to when they actually receive the package that they will be able to name the best possible address. Rather than talk about the elements of the address update e-mail, I’m going to post below the actual address update e-mail that I will soon send to Euphoria backers (I already sent a version of this to backers in Asia, Australia, and New Zealand, many of whom have already received their games). This e-mail is subject to change–I’ll update it as necessary, including if you have some good suggestions in the comments. I learned a lot from the original shipping process with Viticulture, so I’ve tried to cover those bases here. Hi! We’re gearing up to send your game(s) to you in about 2 weeks, and I want to make sure that I have the most accurate addresses for all backers. I have several important questions and comments, so please carefully review this e-mail and save it for future reference. Addresses: If your shipping address has changed since June, please update your address on this Google Form. You can review the address you previously sent me by going to the Euphoria Kickstarter page, scrolling down to the reward level you selected, and click “your response.” If you think you may have messaged me on Kickstarter with a new address over the last few months, you can also view and search your Kickstarter inbox. Please make sure the address you send me is one where you can definitely receive the package any time between (insert date range). If you will be at a location during that time where you can’t receive packages at your normal address, you can send me the address of a friend or family member who can receive Euphoria for you. APO backers (US military): If possible, please provide your current country-specific mailing address. I’ll be able to get your game to you much faster if I can ship to you from within Canada, the EU, the US, Australia, or Asia rather than shipping it to your APO address (which I have to do by hand). Scheduled Delays: Delaying packages for individual backers for specific dates is not feasible; however, given that we will be delivering the games during the holiday season, we will offer a single delayed shipment date on January 10. You can indicate this preference on your survey–if you do, we will submit your shipment to Amazon on January 10 instead of mid-December shipping date, and you will receive your game(s) around January 16-20. We all make mistakes, so please be very careful that you give me the correct address. If I make a mistake while entering your address and your game does not arrive, I will make sure you still get a copy of the game—that’s on me. However, if you make a mistake when sending me your address and the game ends up at your old address or a van down by the river, I cannot send you a free extra game. Everyone gets the game(s) they ordered at the address they provide. Confirmation of Undelivered Games: If you have not received your game by the end of December, you need to let me know. Sometimes people will wait months before telling me their game didn’t arrive, and by that point I may not have any games at all (after ensuring delivery of all games, we allocate remaining Kickstarter copies of games to charitable opportunities). We will wait until at least February to assess the number of extra games we have in stock, but please contact us well before then if you haven’t received your game. One of the troubles of printing both Kickstarter and retail versions of a game: Sometimes the parts get mixed together on the assembly line (the back of the board here should have b/w art). Deluxe vs. Supreme: The deluxe and supreme versions of Euphoria look the same on the outside, so if you were part of a group order, you can tell the difference by looking at the SMC code on the side of the box. Deluxe games are STM201 and Supreme games (the ones with the extra set of dice and cards) are STM203. Damaged Games: If your game arrives damaged, please take a photo of it in the original packaging and send it to me so I can let the shipping company know. The photo needs to clearly show the the packaging (or lack thereof) and the damage to the game. Some people don’t mind a small dent or two, but I understand and will do my best to replace the damaged component unless it is the game box itself. Boxes can’t be shipped flat, so we don’t have replacement boxes. Replacement Parts: It’s important to me that you get the full and best version of your game, and I will respond to any requests for replacement parts. That said, I ask for your compassion and understanding if certain types of tokens are missing or broken. For example, 1 missing water token out of 18 isn’t going to affect the game, and it is quite expensive to send even a small token to international backers. On the other hand, you need exactly 10 authority tokens and 4 dice per player—if any of them are missing, definitely let me know right away so I can replace them at no cost to you. Contact me with the missing/damaged part and your address. Learning the Game: We had over 100 people proofread the Euphoria rules, so they should be pretty good. However, we will build an FAQ as people open and play the game, so feel free to check it out before you play Euphoria for the first time. We’ll upload explanatory videos on this page too–we find that it’s helpful for teaching a game if your game-night guests watch a video about the game in advance. 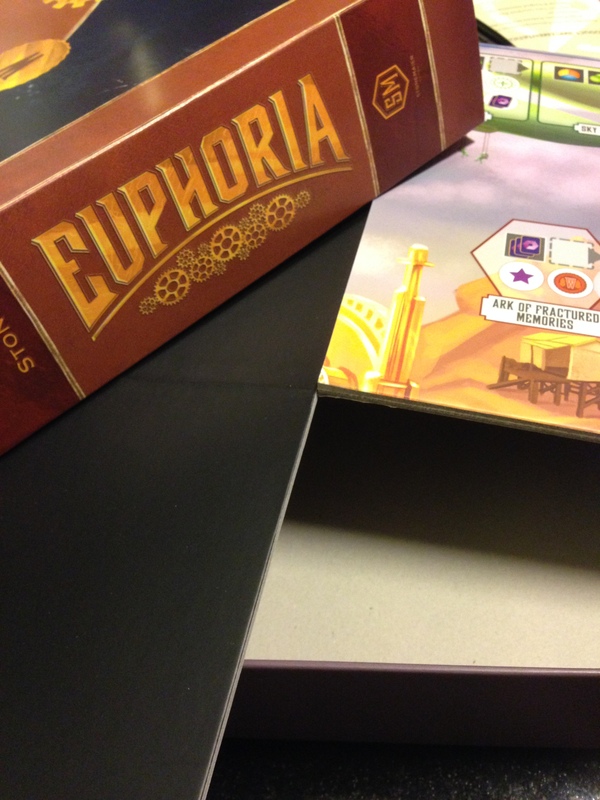 Thank you so much for your support, and I can’t wait to see how you rate Euphoria on BGG after you play Euphoria a few times! Let me know if you have any input about the address update email! I think your up-front policy about not being able to replace damaged game boxes is great. That said, this also requires that you invest in good packing/shipping materials and policies (I’m quite confident that you will handle this with excellence). I’ve had experience with one particular board game publisher that sends their KS packages from overseas to the US in what can scarcely be termed “boxes”; more like they “wrapped” the game with thin cardboard, the way that you would wrap a picture frame in bubble wrap before transporting in a car. The handful of packing peanuts that were thrown in just sort of added to the comic misery of finding one corner of the game box blown apart. Dustin–I agree, I think good packaging is expected of the Kickstarter creator. In my case, that means trusting Amazon fulfillment to do their job. However, I’ve found that they don’t have a 100% perfection rate when it comes to packaging, hence the instructions about taking a photo of the damaged game in the box. Sorry to hear about your bad experience with that poorly packaged game. I haven’t been able to find if you talk about your “database” management solution? You have over 4,000 backers with Euphoria, how do you manage all the information you’ve received via the backer survey? If you have any insights into this area, I’d be very interested! Hi Cody–I’m actually using a spreadsheet as well (and Mozy for backing it up on a regular basis). It’s a lot of names to handle, and I’m sure there’s a better way, but I’m comfortable with it and it’s worked so far. Fortunately you don’t need phone numbers for Amazon fulfillment. Formatting zip codes correctly is really important, though. Let me know if you find any new solutions! I have noticed on some of the KS projects that after the KS project has been funded and the survey has been completed by the backer, the shipping address information the backer provides can be edited. It looks like some of the survey questionnaires get closed completely while others give the backer the option to only update/edit their address before the reward is shipped to them. I have not created a KS project to be funded and i do not know how the after project survey works, I am just wondering from a backer’s point of view. To me as a backer I feel better when I can enter a new address change in the project I funded rather that having to email the project creator. Is it better for the project creator to close the survey completely or leave the address change edit function open until right before shipping? Larry: I can speak from the creator’s point of view that there comes a point when we have to download all of that data from Kickstarter into a spreadsheet to sort out exactly how many copies of the product are going to various fulfillment centers around the world. After that point, we have to lock in address changes on Kickstarter and accept updates in other ways (e-mail and KS message); otherwise there’s a big risk that a backer will update their address on Kickstarter without us realizing it, and thus our master spreadsheet is inaccurate. For me, I download that spreadsheet within a week or two of a project ending, as I need to know exactly how many copies to produce. Except Google Forms do we have any other solutions of updating addresses? 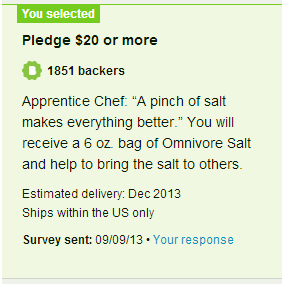 Sure, Kickstarter has a good system for doing so too.